Artistic works inspired by the Fredericksburg experience - scenes, sites, and people. Reception and prizes were generously donated by The Friends of the Library. Congratulations to the winners of the show! Best in Show winner One More Night by Brandon Newton. The frame was made by Larry Hinkle from the last surviving Elm tree that was planted by Corrine Melcher at Belmont. Carrol Morgan is the Curator at the Fredericksburg Center for the Creative Arts (FCCA). She received her BFA Degree from Richmond Professional Institute (Virginia Commonwealth University) and MALS Degree from Mary Washington College. She taught art in King George County Public Schools for thirty-four years, has taught adult and children’s art classes for local arts organizations and is Chairperson of the biennial King George Art Show. She has attended seminars of the Getty Center for Education in the Arts at the University of Cincinnati and the Cranbrook Academy of Art, and the Art Educators’ Forums at the Savannah College of Art and Design. She has studied with Steven Walker, Diane Tesler, Johnny P. Johnson, Sara Poly, Tony Sheets, David Danels, and Willie Crockett. 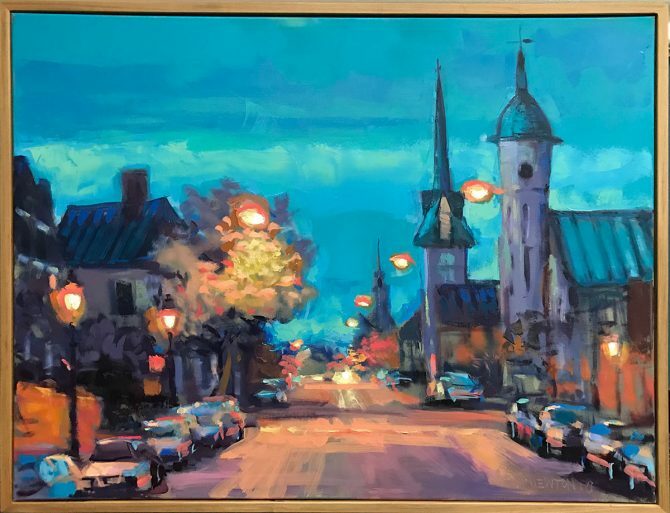 She is a member of the King George Art Guild, the Colonial Beach Art Guild, the Fredericksburg Center of the Creative Arts, and North Windsor Artists. She has exhibited in juried regional, national and group art shows, and her work is in many private collections. She is an advocate for the arts and art education. Read the Judge's Talk here. Click here for the list of accepted works. Generously donated by the Friends of the Library. Prizes awarded in each category.